and in collaboration of Nits Digitals. Some inhabitants from the Romanian region of Dimbovita talk about how they imagine Castellón, the Spanish city to which their relatives and friends emigrated, and where they have never been. Desires, problems, longings and fears of a group of people in a globalised world.The original Romanian voices were dubbed by two Romanians, a woman and a man living in Spain for a long time. The accent is the journey of language. 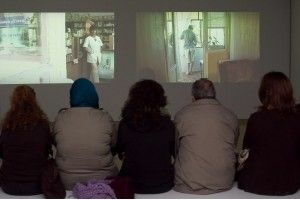 The Video-installation is the result of a prolonged dialogue with the participants. ENTHUSIASM is an artistic proposal bringing together different disciplines around a single multifaceted idea, consisting of imagining a city which we would be excited to live in. It was intended that the project should integrate different citizens' groups to participate in some of its phases. 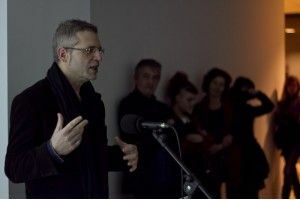 The first part was carried out in Gerona, with el Bòlit Arts Centre, and the second part in Vic, with ACVic and the collaboration of Nits Digitals. ENTHUSIASM II will begin with a workshop to promote meetings and conversations between different groups of residents from a district in Vic, with a view to imagining and shaping a free, vital future. It will deal with providing, within the context of the location, a stimulus and a reason to bring together rich cultural traditions, European and non-European alike. Migrants are the expression of culturally complex contexts, and their presence constitutes an opportunity to open up to the world in a time like ours, in which, everything important to our common future is in jeopardy. Along with the working group which participated in the workshop, a dynamic was established to explore the city together, how to imagine it, how to feel it. Everyone spoke of how they imagined the future, from their cultural viewpoint. 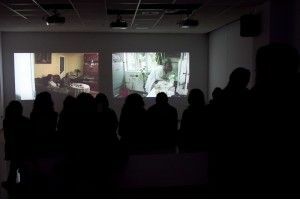 These conversations formed the basis for a staged audiovisual work in which the workshop's participants took part. Claudio Zulian, born in Padua, Italy and currently living in Barcelona, is the creator of a multiform body of work comprising visual arts, film and television, theatre, literature and music,characterised by a sensitivity to social and political issues, as well as by the search for the specificity of each medium. Festivals around the world have embraced his works and documentaries, and in 2010 was awarded the Premi Ciutat de Barcelona and the Premi Nacional de Cinema de Catalunya for his documentary A través del Carmel. 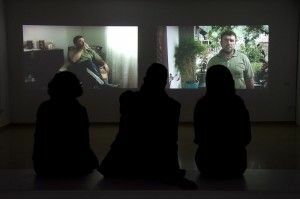 Notable works include No serà el mateix (2011), 2031/2111 (2011) and Després de la violència (2009), video-installations presented at La Virreina and CaixaForum in Barcelona and Recontres Internationals d’Art Paris/Berlin/Madrid; as well as the documentaries Fortuny and La llàntia meravellosa (2010), A lo mejor (2007), A través del Carmel (2006) and the fiction work Beatriz/Barcelona (2004). Currently preparing a film entitled Born ( a Barcelona district), set in eighteenth-century Barcelona. 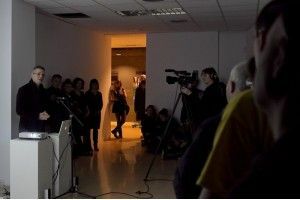 He has produced and directed several contemporary music shows, and in 2010 published a book of documentary poetry entitled A través del Carmel.